Our day at Epcot was honestly the worst day of our trip for me. The reason? I wound up with food poisoning or some awful stomach bug, not sure which. But, before that happened, it started out ok, if rainy. 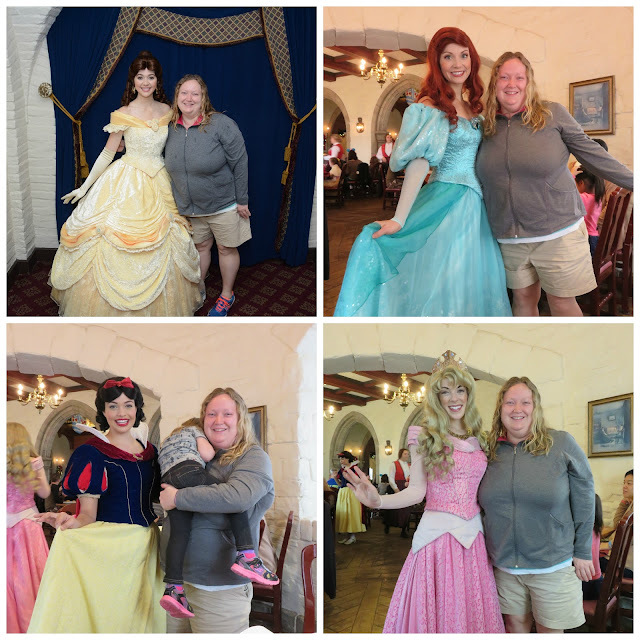 We went to breakfast at the Akershus Royal Banquet Hall in the Norway pavilion where we had breakfast with Belle, Ariel, Snow White and Aurora. Ewan had been saying all along that he didn't want anything to do with them and Cecily was continuing in her tradition of not wanting her photo taken with characters, although she did hand them our book to sign. All of the princesses were great about it, except for Snow White, who told her that she wouldn't meet very many princesses with the way she was acting, which kind of made me mad. The food was also like all of the breakfast buffets, ok but definitely not worth what you pay for it. After we had breakfast, Ewan and Alan had fast passes for the Test Track, which they did while Cecily and I perused the main shop. Ewan loved designing his car, but wasn't so fond of going super fast. Unfortunately, because it was raining, we wound up waiting extra long because they were running slower than usual and were going back and forth between closing and opening the track. After we ate lunch, we wandered around all of the country pavilions to hopefully let the kids nap and kill time before our dinner reservations at Restaurant Marrakesh in the Morocco Pavilion. I have seen the originals of all of these! While we were wandering around, I got to see Alice and Mary Poppins. 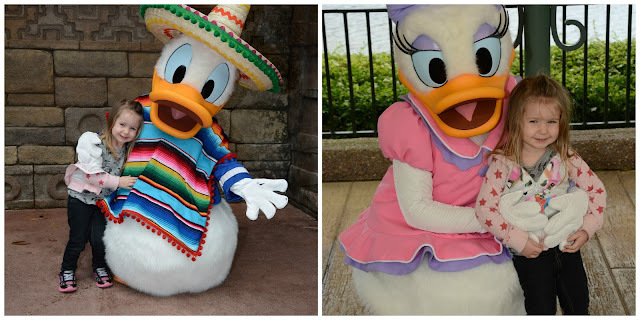 After we saw Donald and Daisy, we were trying to figure out what to do when I all the sudden felt like I was going to be sick. I wasn't and told Alan that I was fine and that we should go ride Living With the Land, which is a boat ride that goes through and shows you how a lot of the food is grown at Disney. Something that would be right up my alley. We went on the ride and I made it a couple minutes and knew. I wasn't going to make it. I was going to be sick. Luckily Alan had a bag from one of the stores we went to earlier, but it was so embarrassing! I wound up apologizing to the people in front of me because I'm pretty sure they were about to be thrown up on. At this point, Alan was telling me that we should just go back to the hotel, but I felt ok and I didn't want us to end up paying a fee for missing our reservations so I told him that we could go to dinner, even if I didn't eat much. We went to dinner and that's when it hit. I was running to the bathroom every couple of minutes and Alan was stuck trying to entertain the kids. To an outsider, it was probably quite comical. I keep running away and Alan is changing seats every time our waiter came back. Poor guy, he had no idea what was going on. We made it through dinner and all I wanted to do was get out of there. 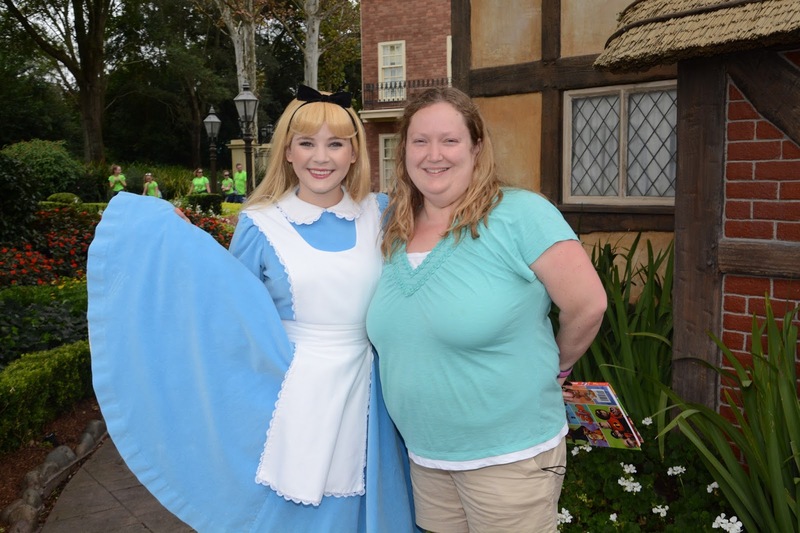 I was hightailing it to the car before I got sick again and we saw Cinderella in France, but I didn't care. I get wanted to get out of there. Unfortunately she is the only person that I really wanted to see that we didn't get to. Alan did, however, take some really pretty photos of the dome all lit up at night. Once we got back to our resort, I was asleep in seconds. We're not really sure what was going on with me, but no one else got sick thankfully. That really would've been no fun!